May 4, 2011 – Riverside, CA: Best in the Desert Silver State 300 wasn’t the race that Kevin Sacalas of Big Ugly Racing was hoping for, but it did prove beyond a doubt, that his new car is fast; very fast. By the first check point, Sacalas had a 45 second lead on the next Ultra4 car being driven by 2011 King of the Hammers winner, Shannon Campbell, and a 34 second lead on Campbell’s Class 1 car driven by Shannon’s brother, Nick Campbell. 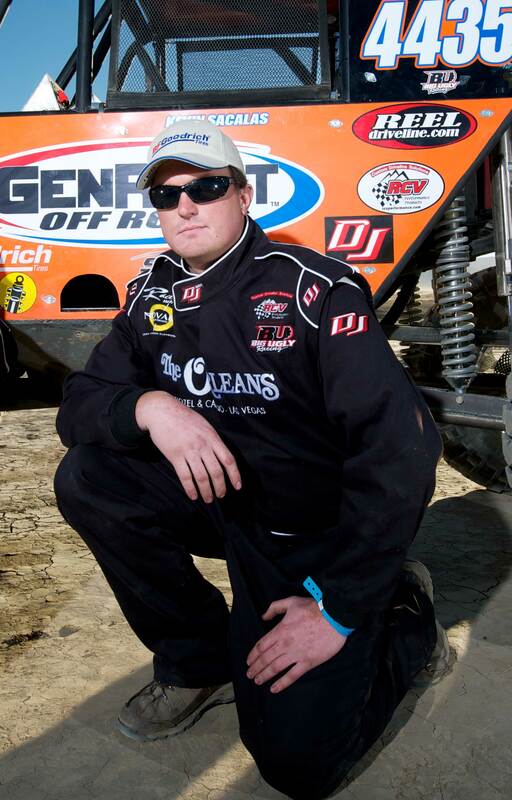 Sacalas’ prior Best in the Desert races have been successful for the 28 year old Ultra4 driver from Riverside, California. He placed 1st in 2009’s Vegas to Reno and 2nd in 2010’s Silver State 300 driving his original Ultra4 car which had 200 less horsepower than his current vehicle. Based on his Best in the Desert track record and the speed of his new car, Sacalas went into last weekend’s race with one goal; to win the Silver State 300 for the Ultra4 class, and early accounts showed he was on track to do just that. According to satellite tracking, by race mile 50, Sacalas had passed all but one Ultra4 car, had hit a top speed of 116 MPH, and on corrected time was leading the pack. The race looked as though it would be a 3-way head-to-head competition between last year’s King and Silver State winner, Loren Healy, this year’s King and eventual Silver State winner, Shannon Campbell and Sacalas, with Sacalas taking the early lead. Unfortunately, due to a mechanical failure, the car lost the ability to go forward under its own power. After spending a half an hour trying to repair the problem on the side of the course, Sacalas concluded it was not something he could fix remotely. Driving backwards, with the assistance of his co-driver, Tim Carlson navigating with his head out the window, Sacalas was able to make it the remaining 5 miles into the pit. Once there, Sacalas and his crew determined that due to the pit closing times and the major repair necessary to potentially fix the problem they would have to call the race. Sacalas and his new car, nick named by fans, Big Ugly 2.0, will be next be seen at the Lucas Oil Regional Short Course at Glen Helen on June 11th, and his next Ultra4 race will be the American Rock Sports Challenge at Miller Motorsports Park in Utah on July 16th.